Team Torrent was formed in 1998 when I was fortunate to be loaned the 16.3h gelding, Torrent. Torrent changed my life, literally. He took me from being a producer of show horses and an ok rider at unaffiliated Elementary level to being unbeaten at Regional Championships from Prelim to Medium, to winning the BD National Championships at Prelim and Novice in our first season and successfully progressing through the levels to PSG when unfortunately he had to be retired. Torrent introduced me to people, horses and a world that I otherwise I would not have known. For that I owe him, and his generous owner, Mrs Susan Erian, everything. Although Torrent is now retired, we felt it appropriate that his name carried on and so my horses all compete under the umbrella of Team Torrent. I have in excess of 35 years experience working in the equine industry and since concentrating on dressage have competed successfully with a number of horses, up to and including Intermediaire 1 level. We are regular competitors at both Summer and Winter BD Regionals, and have competed at the BD Nationals on many occessions, always making the top ten. I have been involved with BYRDS training in our region and train a variety of riders from grass roots upwards, aiming to give confidence, enthusiasm and structure to all. Pupils have qualified for and been successful in a wide variety of Championships from Pony and Riding Club, BD Regional Championships from Prelim to Medium and BYRDS Talent Spotting Finals. Previous to my dressage career, I was actively involved in the show and stud scene. 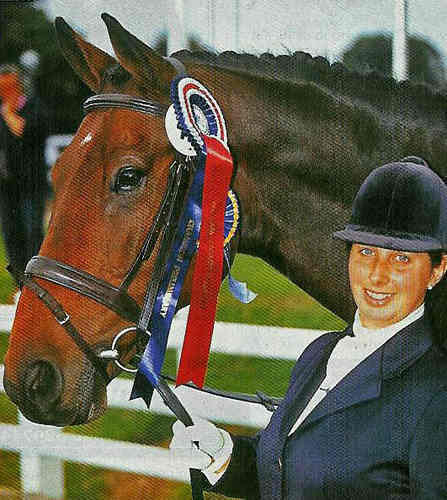 Employed as head girl to a number of excellent studs, I produced ridden and in hand horses and ponies to county and National Championship success including HOYS and RIHS. I attained my NPS Stud Assisstant and Diploma examinations and also trained many students for the Stud Assistants examination with a very high pass rate. I have also been a ridden panel judge at county and national level.